President Richard Milhous Nixon was born in Yorba Linda, California, on January 9, 1913. Interesting to see so little public acknowledgement of Nixon’s presidency and his trials and vexations, which history offers insight and perhaps solutions to problems the nation has today. Some views of Richard Nixon. 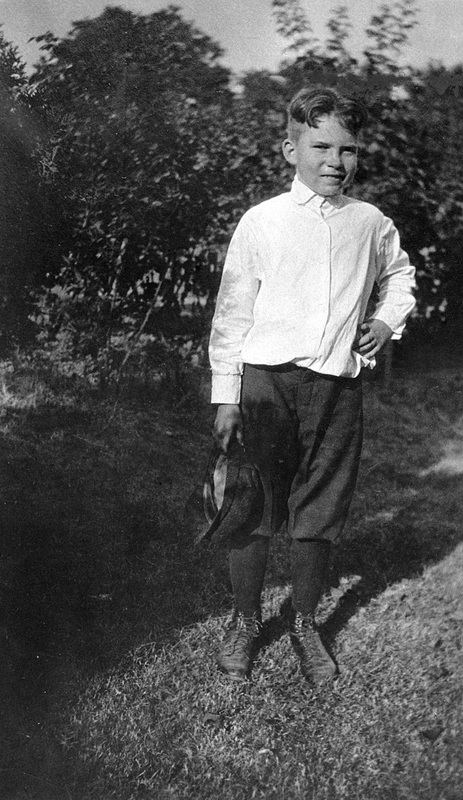 National Archives and Records Administration image: Nine-year old Richard Nixon in Yorba Linda, 1922. National Archives Identifier: 306-PSD-68-3769. 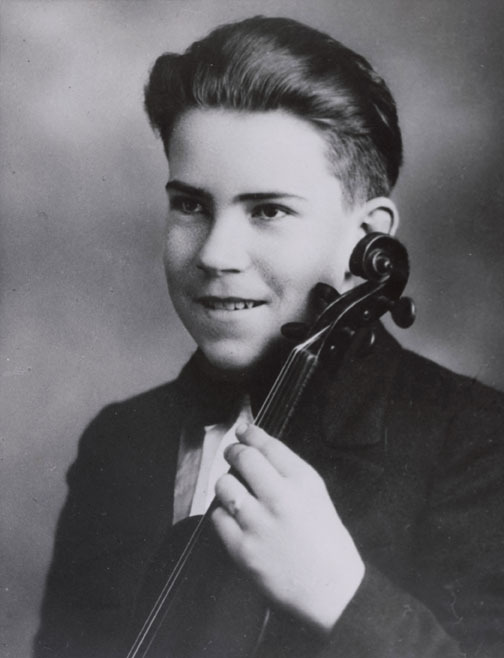 Richard Nixon, age 15, holding his violin, ca 1927-1928. Richard Nixon learned to play the violin, clarinet, saxophone, piano, and the accordion. When he was 12, Richard was sent to live and study music with his mother’s sister in central California. He returned home six months later and eventually discontinued his studies, but his love of music continued. Richard Nixon Presidential Library & Museum. 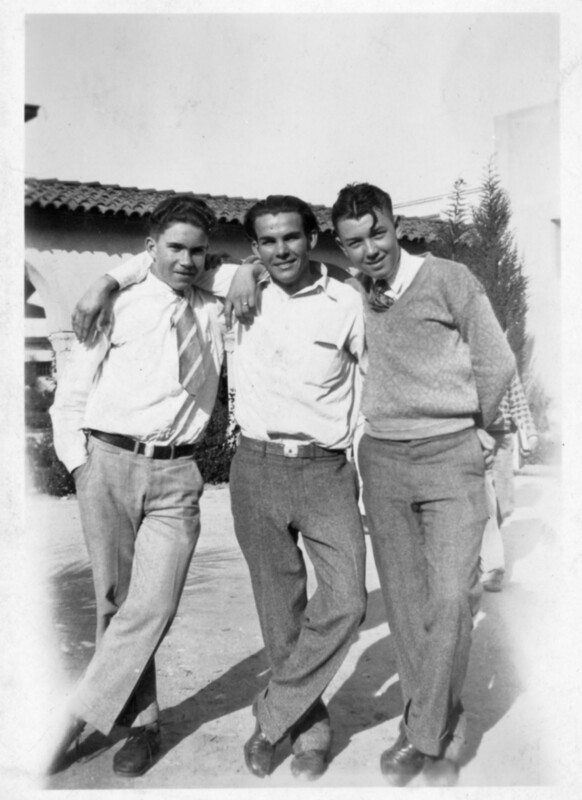 Richard Nixon with two friends, Fullerton High School, Fullerton, CA, circa 1929. (Surely someone could identify the other two men. I wonder who they are? What happened to them?) Richard Nixon Presidential Library & Museum Identifier: WHPO-B-0199. 1945 photograph of Lt. 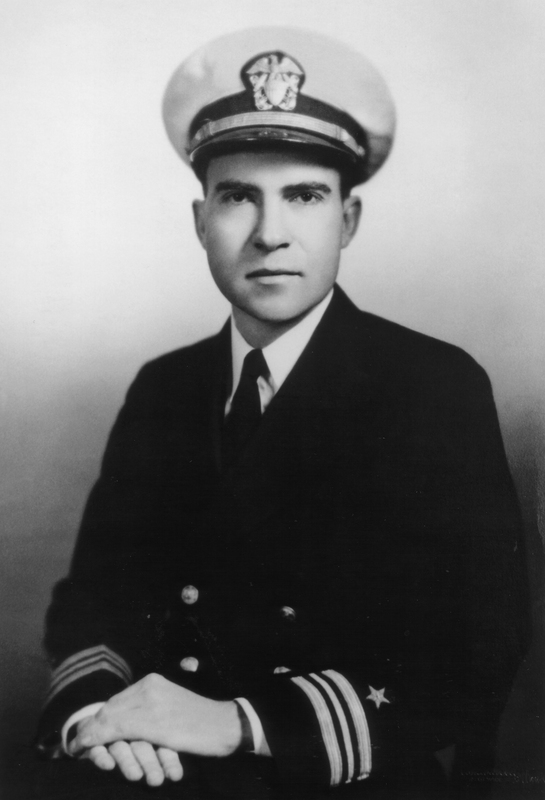 Commander Richard Nixon wearing his Navy uniform. When Richard Nixon ran for Congress in 1946 he wore his Navy uniform as he declared at the time that he did not have a civilian suit. Richard Nixon Presidential Library and Museum, used with permission of the Richard Nixon Foundation and Julie Nixon Eisenhower. 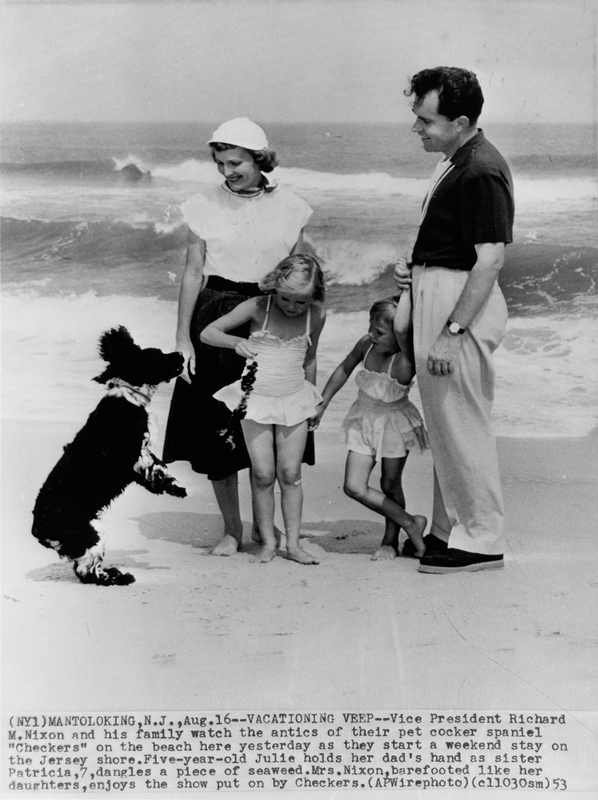 Vice-President Richard Nixon, with wife Pat and daughters Tricia and Julie, watch the antics of their pet cocker spaniel “Checkers” while on a weekend visit to the Jersey Shore in Mantoloking, NJ, August 16, 1953. Richard Nixon Presidential Library and Museum, used with permission of the Richard Nixon Foundation and Julie Nixon Eisenhower. 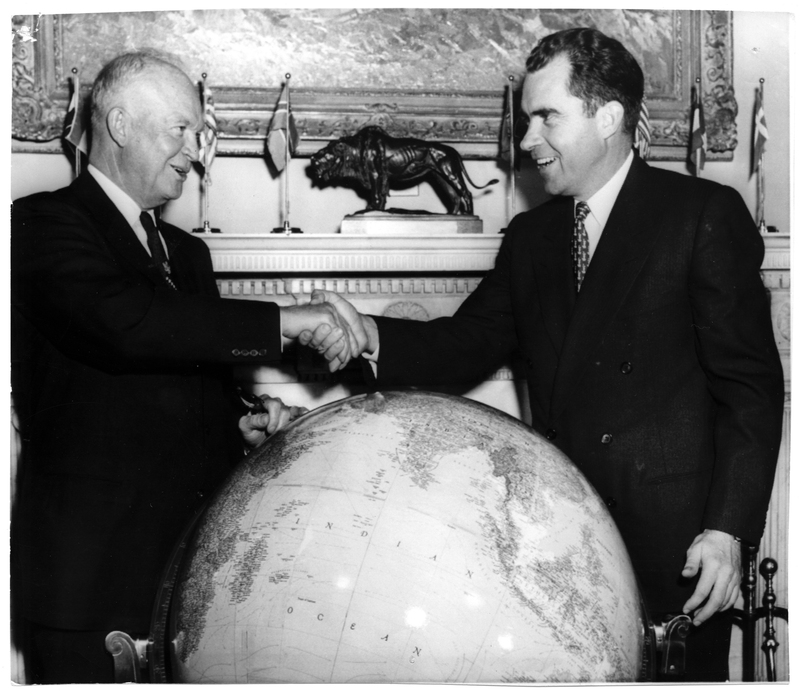 President Dwight D. Eisenhower and Vice President Richard Nixon at the White House before the Vice President’s Ambassador of Goodwill tour departure to the Far East, October 5, 1953. Richard Nixon Presidential Library and Museum, used with permission of the Richard Nixon Foundation and Julie Nixon Eisenhower. Vice-President Nixon spars with Premier Khrushchev before reporters and onlookers, including Politburo member Leonid Brezhnev at the American National Exhibition at Sokolniki Park, in Moscow, 1959. 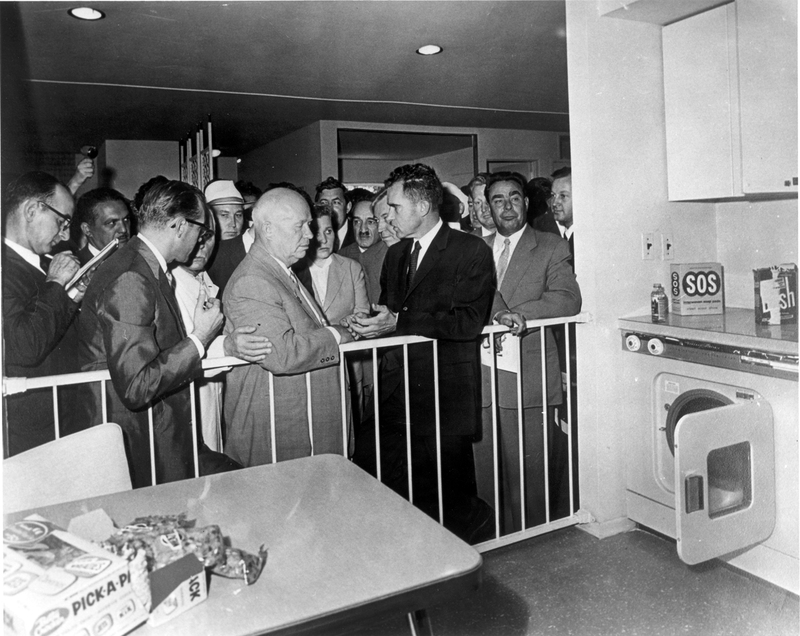 Nixon and Khrushchev are photographed in front of a kitchen display – the impromptu exchanges came to be known as the Kitchen Debate, July 24, 1959. Richard Nixon Presidential Library and Museum, used with permission of the Richard Nixon Foundation and Julie Nixon Eisenhower. Nixon’s life offers many interesting twists and turns. His Watergate scandal rather overshadows much of the rest — I think high school textbooks do not spend enough time on telling why Nixon was considered a good candidate for the presidency after losing to John F. Kennedy in the 1960 election, nor do they dwell enough on the effect of the Cold War on his career, and his effect on the Cold War. Check your kid’s U.S. history book — is the Kitchen Debate even mentioned? Nixon would have been 105 years old on January 9. We might pause to reflect, and learn, from his life and trials. Oh, how things have changed! Birthday wishes for Alexander Hamilton, still! I posted this back on January 11, 2012, a birthday note for Alexander Hamilton. In 2012, most Americans would have simply been puzzled by a request to tell them about the guy on the $10 bill. Then stardom hit. Lin-Manuel Miranda, who in 2012 had just a couple of songs and an idea about a musical about Hamilton, finished the piece, produced it on Broadway, and set records for attendance and Tony awards, and generally raised Alexander Hamilton’s profile. Here is that post from 2012, with only editing for errors and time. But of course, the bullet from Aaron Burr’s gun cut Hamilton’s life short, after the duel in Weehawken, New Jersey. Hamilton died of the wound on July 12, 1804. He was 47 years old. Had Hamilton survived the duel, would he have been elected president? Some people think so. In any case, Hamilton’s wise management of the new nation’s finances, and his establishment of the idea that government should have a working bank, and that good government is a key to economic success of a nation, leave a great legacy for the nation, and the world. 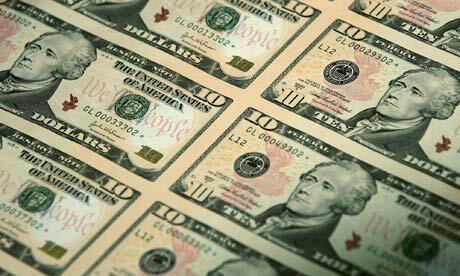 Hamilton’s portrait adorns the U.S. $10 bill. Hamilton was born in 1757 on the island of Nevis, in the Leeward group, British West Indies. He was the illegitimate son of a common-law marriage between a poor itinerant Scottish merchant of aristocratic descent and an English-French Huguenot mother who was a planter’s daughter. In 1766, after the father had moved his family elsewhere in the Leewards to St. Croix in the Danish (now United States) Virgin Islands, he returned to St. Kitts while his wife and two sons remained on St. Croix. The mother, who opened a small store to make ends meet, and a Presbyterian clergyman provided Hamilton with a basic education, and he learned to speak fluent French. About the time of his mother’s death in 1768, he became an apprentice clerk at Christiansted in a mercantile establishment, whose proprietor became one of his benefactors. Recognizing his ambition and superior intelligence, they raised a fund for his education. In 1772, bearing letters of introduction, Hamilton traveled to New York City. Patrons he met there arranged for him to attend Barber’s Academy at Elizabethtown (present Elizabeth), NJ. During this time, he met and stayed for a while at the home of William Livingston, who would one day be a fellow signer of the Constitution. Late the next year, 1773, Hamilton entered King’s College (later Columbia College and University) in New York City, but the Revolution interrupted his studies. Although not yet 20 years of age, in 1774-75 Hamilton wrote several widely read pro-Whig pamphlets. Right after the war broke out, he accepted an artillery captaincy and fought in the principal campaigns of 1776-77. In the latter year, winning the rank of lieutenant colonel, he joined the staff of General Washington as secretary and aide-de-camp and soon became his close confidant as well. In 1780 Hamilton wed New Yorker Elizabeth Schuyler, whose family was rich and politically powerful; they were to have eight children. In 1781, after some disagreements with Washington, he took a command position under Lafayette in the Yorktown, VA, campaign (1781). He resigned his commission that November. Hamilton then read law at Albany and quickly entered practice, but public service soon attracted him. He was elected to the Continental Congress in 1782-83. In the latter year, he established a law office in New York City. Because of his interest in strengthening the central government, he represented his state at the Annapolis Convention in 1786, where he urged the calling of the Constitutional Convention. In 1787 Hamilton served in the legislature, which appointed him as a delegate to the convention. He played a surprisingly small part in the debates, apparently because he was frequently absent on legal business, his extreme nationalism put him at odds with most of the delegates, and he was frustrated by the conservative views of his two fellow delegates from New York. He did, however, sit on the Committee of Style, and he was the only one of the three delegates from his state who signed the finished document. Hamilton’s part in New York’s ratification the next year was substantial, though he felt the Constitution was deficient in many respects. Against determined opposition, he waged a strenuous and successful campaign, including collaboration with John Jay and James Madison in writing The Federalist. In 1787 Hamilton was again elected to the Continental Congress. When the new government got under way in 1789, Hamilton won the position of Secretary of the Treasury. He began at once to place the nation’s disorganized finances on a sound footing. In a series of reports (1790-91), he presented a program not only to stabilize national finances but also to shape the future of the country as a powerful, industrial nation. He proposed establishment of a national bank, funding of the national debt, assumption of state war debts, and the encouragement of manufacturing. Hamilton’s policies soon brought him into conflict with Jefferson and Madison. Their disputes with him over his pro-business economic program, sympathies for Great Britain, disdain for the common man, and opposition to the principles and excesses of the French revolution contributed to the formation of the first U.S. party system. It pitted Hamilton and the Federalists against Jefferson and Madison and the Democratic-Republicans. During most of the Washington administration, Hamilton’s views usually prevailed with the President, especially after 1793 when Jefferson left the government. In 1795 family and financial needs forced Hamilton to resign from the Treasury Department and resume his law practice in New York City. Except for a stint as inspector-general of the Army (1798-1800) during the undeclared war with France, he never again held public office. While gaining stature in the law, Hamilton continued to exert a powerful impact on New York and national politics. Always an opponent of fellow-Federalist John Adams, he sought to prevent his election to the presidency in 1796. When that failed, he continued to use his influence secretly within Adams’ cabinet. The bitterness between the two men became public knowledge in 1800 when Hamilton denounced Adams in a letter that was published through the efforts of the Democratic-Republicans. In 1802 Hamilton and his family moved into The Grange, a country home he had built in a rural part of Manhattan not far north of New York City. But the expenses involved and investments in northern land speculations seriously strained his finances. Meanwhile, when Jefferson and Aaron Burr tied in Presidential electoral votes in 1800, Hamilton threw valuable support to Jefferson. In 1804, when Burr sought the governorship of New York, Hamilton again managed to defeat him. That same year, Burr, taking offense at remarks he believed to have originated with Hamilton, challenged him to a duel, which took place at present Weehawken, NJ, on July 11. Mortally wounded, Hamilton died the next day. He was in his late forties at death. He was buried in Trinity Churchyard in New York City. Post mostly borrowed, with express permission, from Mr. Darrell’s Wayback Machine. Remember to watch for progress on “The Alexander Hamilton Mixtape,” a hip-hop version of Alexander Hamilton’s life by Lin-Manuel Miranda, seen here performing Aaron Burr’s soliloquey, at the White House. 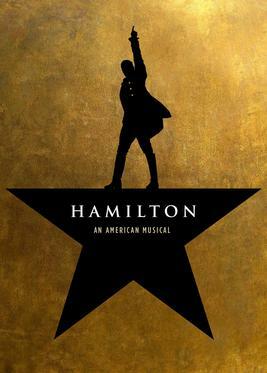 Poster for Lin-Manuel Miranda’s musical play, “Hamilton.” Wikipedia image. Happy 219th birthday, Millard Fillmore! Millard Fillmore, future 13th President of the United States, was born on January 7, 1800, in upstate New York. Victim of one of the most infamous hoaxes in history, Millard Fillmore’s good works are often forgotten. It’s that hoax that gives the name to this blog, and preventing or stopping other similar hoaxes which is the hope of the author. 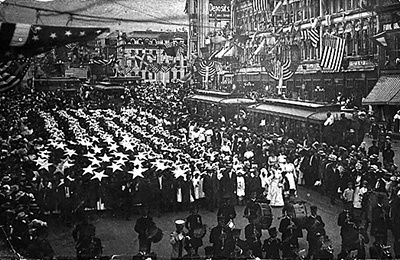 In the past 50 years residents of Buffalo revived the reputation of Fillmore, and started a tradition of celebrating his birthday. 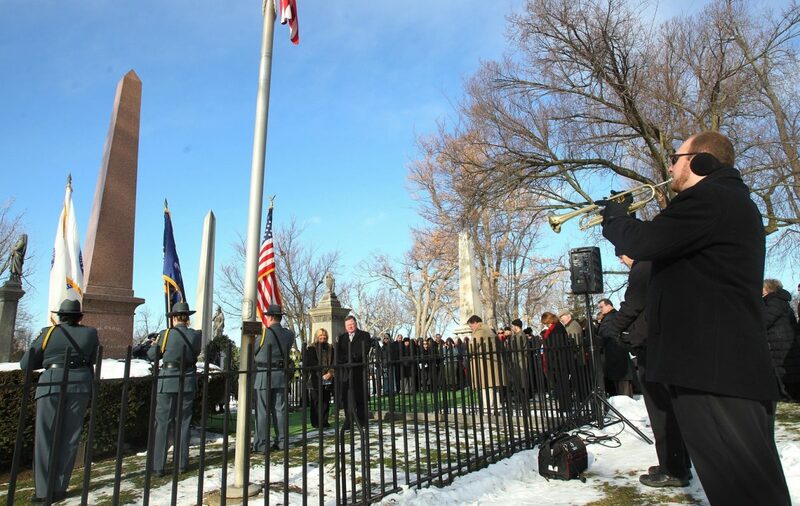 Trumpeter plays taps at the grave site of President Millard Fillmore in Buffalo, New York’s Forest Lawn Cemetery, with a military honor guard and dignitaries from the University of Buffalo, which traces its founding to Fillmore. This is a Buffalo News photo of an earlier celebration, perhaps 2015. But so far as I have found, no bathtub races occurred this year. You are currently browsing the Millard Fillmore's Bathtub blog archives for January, 2019.